Getting to Sierra-at-Tahoe is easy! 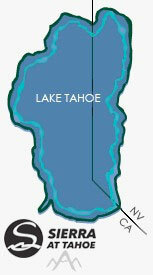 We are located 12 miles west of South Lake Tahoe, about 90 minutes from Reno and roughly three hours from the Bay Area. Come get some of our locally sourced, GMO FREE Snow! To get to Sierra-at-Tahoe, you can fly into the Reno-Tahoe International Airport (RNO - 75 miles), the Sacramento International Airport (SMF - 98 miles), Oakland International Airport (OAK - 175 miles), or San Francisco International Airport (SFO - 181 miles). 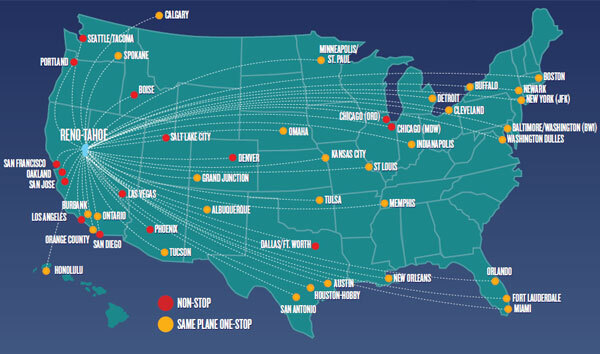 Located about an hour from the largest concentration of world-class skiing in North America, Reno-Tahoe International Airport offers over 140 daily flights to and from 15 non-stop destinations and 31 same plane, one-stop destinations. Non-Stop Destinations: Chicago/Midway (MDW), Chicago/O'Hare (ORD), Dallas, Denver, Las Vegas, Los Angeles, Phoenix, Portland, Salt Lake City, San Diego, San Francisco, San Jose and Seattle. Same Plane One-Stop Destinations: Albuquerque, Austin, Baltimore/Washington (BWI), Boston, Buffalo, Burbank , Calgary, Cleveland, Detroit, Fort Lauderdale, Grand Junction, Honolulu, Houston/Hobby (HOU), Indianapolis, Kansas City, Memphis, Miami, Minneapolis/St. Paul, New Orleans, Newark, New York (JFK), Omaha, Ontario, Orange County, Orlando, San Antonio, Spokane, St. Louis, Tucson and Tulsa. South Tahoe Express shuttle provides round-trip transportation from Reno-Tahoe International Airport to South Lake Tahoe. Driving to Sierra by car is one of the most breathtaking journeys you'll ever take. Towering snow-capped mountains, lush green National Forests, fast-flowing rivers and breathtaking views of the largest alpine lake in North America will be forever etched into your memory. Check the most current road conditions before you leave. US-395 becomes US-50. Continue straight. Save some gas, carbon emissions and money by carpooling to Sierra or sharing a ride! Skedaddle believes travel should no longer be hindered by renting expensive cars, hassling friends for rides, or piecing together antiquated mass transportation. By pairing crowdsourced route demand with luxurious rides, Skedaddle makes affordable, inspiring, and flexible travel available to all. Get to Sierra, together! Zimride is a simple way to find friends, classmates and coworkers who are headed to Sierra. Combining social networks and Zimride's proprietary route-matching algorithm, they make it easy to share the seats in your car or catch a ride. Catch a ride to Sierra and create social, sustainable and convenient transportation. Serving Sacramento, San Francisco, South Bay, on Meetup.com. A winter sports community passionate about snowboarding and skiing, organizes carpools to Sierra-at-Tahoe so you can experience the mountain with new friends, and you don't have to drive! *PLEASE NOTE: While we are pleased to make you aware of these resources, Sierra-at-Tahoe is not responsible in any way with your use of these programs. You are responsible for your own safety. Sierra-at-Tahoe will not be held liable for delays caused by road conditions, weather, breakdowns and other conditions beyond their control, and do not guarantee to arrive or depart from any location at a specific time. Jump on the complimentary South Shore Shuttle providing a comfortable and convenient alternative to driving from South Lake Tahoe or Placerville area to Sierra-at-Tahoe! Shuttle service ends in April 2019. Bay Area Ski Bus is the premier shuttle-bus service from the San Francisco Bay and Stockton areas since 1996! Trips are open to the public and private groups. Sleep in the am, breakfast when you wake up, grab your ticket as you exit, ski or ride all day, return to the bus for the ares ski party, then watch movies on the way home! Pure convenience and fun! With over 1500 bus trips under their belt, they have it dialed. Unwind on the way back with movies, trivia, or just more sleep! Enjoy all this and more for not much more than a lift ticket. Please call 925.680.4386 or visit www.bayareaskibus.com for pricing and dates! North American Charter Ski is offering ski bus trips from South Bay, Mid-peninsular, San Francisco and East Bay on multiple weekends throughout the season. Besides discounted lift tickets, you can also book various rentals, beginners package, group lessons, etc. Please visit www.nacski.com/sierra to reserve your seat. Please call 925.230.2086, email info@nacski.com or visit www.nacski.com/sierra for more information. Attention College Students! - NAC SKI offers campus pickups from the below locations. Get out of bed, hop on the bus! Ride with Santa Rosa Ski and Sports on one of their many premiere shuttle bus trips serving the Greater North Bay and Wine Country for 25+ yrs. Join scheduled public trip dates or book a private excursion for your group throughout the season. Take a nap on the way up, wake to your choice of multiple breakfast options, upon arrival enjoy the multiple amenities Sierra-at-Tahoe has to offer, rendezvous back at the shuttle for movies, trivia, prizes/giveaways before touching back down in Santa Rosa. To sign up, please call Santa Rosa Ski and Sports at 707.578.4754 or stop by 1125 W. Steele Lane, Santa Rosa, CA 95403. Scheduled dates and rates can also be found at www.santarosaskiandsports.com/SierraAtTahoe. Lake Tahoe, which straddles the California-Nevada state line, is one of the most beautiful lakes in the USA. Located just 200 miles from San Francisco, Lake Tahoe is famous for its clarity, deep blue water, and surrounding snowcapped peaks. It is also the largest alpine lake in North America. Lake Tahoe waters soak up the colors of the sky and the mountains, creating a kaleidoscope of sparkling blues, greens, and purples.It's no wonder, Mark Twain declared it "the fairest picture the whole earth affords." Lake Tahoe is the largest alpine lake in North America and the second deepest lake in the U.S. If Lake Tahoe was emptied, it would submerge California under 14” of water. There is enough water in Lake Tahoe to supply everyone in the United Sates with 50 gallons of water per day for five years. The amount of water that evaporates from the surface of Lake Tahoe every year could supply a city the size of Los Angeles for 5 years. Due to its depth, Lake Tahoe never freezes. Here are a few of our favorite places around South Shore - where we take our friends & family. The Lake - Blue, deep, and alpine pure, Lake Tahoe offers breathtaking views as well as fun water activities and scenic cruises. The Sun - It is sunny in Lake Tahoe 75% of the year, or 274 days. Check out the 5-day forecast for Sierra-at-Tahoe. Snow, Snow, Snow - At lake level, annual snowfall averages 125 inches. At alpine skiing elevations, the snowfall averages 300-500 inches each year making for spectacular skiing and snowboarding! Check out the snow conditions at Sierra-at-Tahoe. The Great Outdoors - A ring of national forests, recreation areas, and miles of trails make Lake Tahoe a nature lover's paradise year round. Gaming & Nightlife - Put on your dancing shoes, grab a lucky penny and check out Lake Tahoe's hotspots for twenty-four hour gaming, cabaret shows, live music & dancing.